Hello there, a few weeks ago my daughter grandson and I went to Williamsburg Va. for a few days. It was so lovely there, crepe myrtles were in bloom everywhere. This is the first painting I did from some of my reference photos and I will be painting others. This is oil on a 8 X 10 stretched canvas. Hi, I painted this a few weeks ago on a plein air outing. This is a park near here called Pine Hill Lakes, a sweet little park with two lakes, walking trails and a wonderful playground for the kids. This is oil on a 8 x 10 stretched canvas. I painted outside yesterday, it was the perfect day. I was in the shade painting the side of a sunlit house and hummingbirds we checking me out, so great. I have really enjoyed painting outside this year and I'm looking forward to fall. I have been framing and getting ready for the event I am doing on Tuesday, little nervous to be demonstrating even though I paint in public quite often. If you live near me please stop and visit me at Performance Lexus in Mason 5:30-8, cocktails, great food and a room full of artists demonstrating. Hi Everyone, I painted this recently using a reference from Morguefile.com, a site with lots of reference photos and you are welcome to paint using them. Not sure where this is but I loved the orange fields, the cloudy sky and of course the road leading off over the hill. This is oil on a 11 x 14 stretched canvas. We are having storms at the moment but it is supposed to cool off next week, high in the mid -eighties. I hope to do some plein-air painting this week with the cooler temperatures. If you would like to receive an email when I do a new post just put your email address in the google group box. Hello everyone, I painted this from a painting by Edward Potthast, it isn't his complete painting. I painted it in oils on a 6 x 6 panel and wanted it to fit this square format. 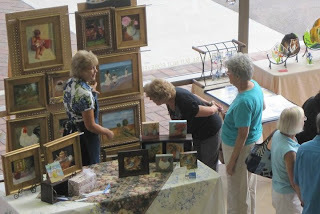 I am doing an event on August 24th, it is a kick off for our local arts festival this year. A wonderful event with food, music and a room full of artists demonstrating their work. I thought it would be fun to give something away so I will have a drawing for this little piece. I am so flattered they asked me to be a part of this event. I participated in a plein air event yesterday in a town called Milford, Ohio. A fun day with about 40 artists attending. I completed one piece which didn't sell but I get to hang it in a local art gallery for the month so who knows. If you recall I told you about hanging some of my work in a model home near here, very happy to report that I recently sold two paintings. I have the best job in the world, have I told you that? :) Have a great day! Hello there. This is one of the plein air paintings I did this summer. The car was quite the mess with the windows out, I tried to make it interesting with warms and cools. This is oil on a 8 X 10 stretched panel and is available to purchase. I went out this morning to paint, tried it for a bit and the heat ran me off. It is supposed to cool off a bit for the weekend. 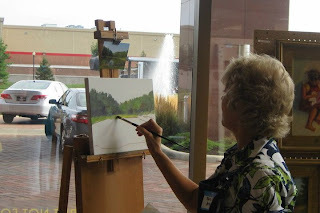 I am doing a plein air event on Saturday with the Ohio Plein Air Society, should be fun. In a recent post I told you I had two paintings hanging in the Cincinnati art museum for a temporary display, it was great to be there and to top it off the museum is feeding us lunch on Friday and I get 2 passes for the year. They didn't have to give us anything, just hanging there is an honor. Hi there, Well it has been just over a week since I posted, that is a long time for me. I spent most of this week in Williamsburg Va. with my daughter and grandson. We had a great time although it was extremely hot. I didn't get to paint any but did take lots of photos and some of those will eventually turn into paintings I'm sure. This painting was done a few weeks back here in my town of Mason, Ohio. This is a row of very old buildings right in the middle of town. They recently added a square in front where you see the wall and steps. This was done mostly on location, I did adjust some things once I got it home. This is oil on a 8 x 10 stretched canvas.